Beverly Hills, is celebrating its 100th anniversary throughout 2014, beginning in March and running through the end of the year, five of the most luxurious hotels in Beverly Hills will bring you Suite 100: The Beverly Hills Hotel, The Beverly Hilton, Viceroy L'Ermitage Beverly Hills, Montage Beverly Hills and Peninsula Beverly Hills. Each participating property will redesign a suite to capture a moment in time from the last 100 years. Inspired by celebrities, fashion and lifestyle trends, all suites promise unique, era-specific experiences for guests. 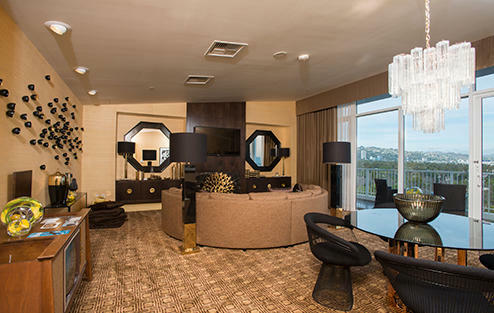 From the fun-loving style of the Studio 54 era to the classic flair of the Marilyn Monroe age, Suite 100 offers visitors an opportunity to uniquely experience the legendary style of the city and iconic eras of the last century. promise unique, era-specific experiences for guests. Created by Nina Petronzio, Suite 100 captures the sultry sophistication and mystique of Film Noir that was epitomized in the 1940s. Petronzio has designed bespoke, art-deco inspired furniture, gold and silver leaf and mirrored finishes. Accessories include a collection of Lalique crystal, as well as fun touches such as a vintage phonograph and typewriter and a “Press for Champagne” button. 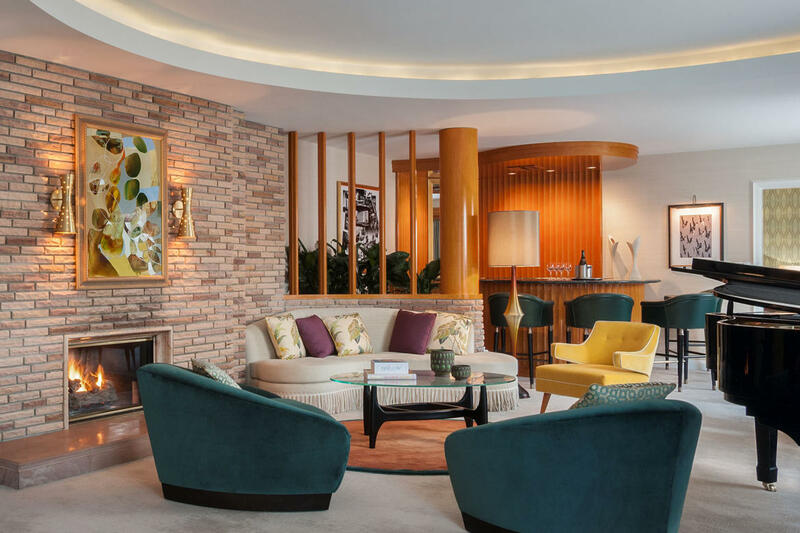 Tihany Design drew inspiration for Suite 100 from the glamorous lifestyle of Marilyn Monroe, a frequent hotel guest, and the “understated elegance” of Paul Williams, the celebrated architect who designed the hotel’s Polo Lounge, signage and iconic pink-and-green color scheme. Gracefully curved furnishings in rich hues complement the existing architectural details. Quintessentially Californian, the design features black lacquer finishes, tropical prints, shag carpets and a sycamore wood bar. Inspired by the sophisticated yet rebellious attitude of the 1960s, when The Beverly Hilton epitomized the era’s glamour, this Suite 100 embodies the elegance of actress Audrey Hepburn; the sophistication of Tipi Hedren, star of Alfred Hitchcock’s The Birds; the interior design bravado of David Hicks, who was noted for using bold colors; the musical innovation of Brazilian singer-songwriter Gilberto Gil; and Tom Ford Design showcase furnishings along with the panache of the then-popular Hollywood-Regency style. Legendary designer Ken Fulk has created an homage to Any Warhol’s Factory, disco and 1970’s fashion. High-gloss lacquer, mirror finishes, and vintage fashions in the closet balance against the use of Ultrasuede throughout the expansive suite. Features include a powder room papered in Interview Magazine covers, a “Do Not Disturb” sign that plays on Warhol’s portraits and an interactive iPad photo booth mimicking the paparazzi adjacent to the room’s elevated catwalk. 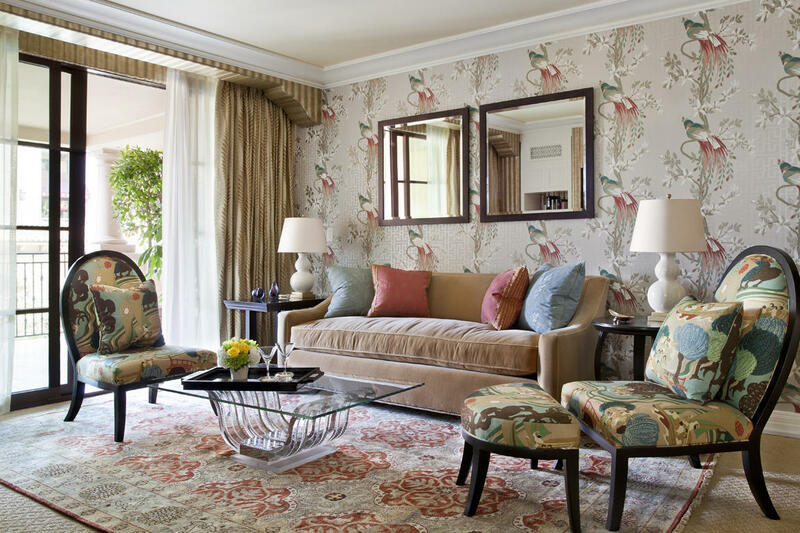 Forchielli Glynn has transformed a suite into the embodiment of modern Hollywood glamour at The Peninsula Beverly Hills, which opened in 1991. Inspired by the excitement of Awards Season - The Golden Globes, The Grammys, The Oscars - when the hotel plays host to Hollywood VIPs and celebrities, the suite’s walls are clad in photographic murals of a red carpet Hollywood gala event. 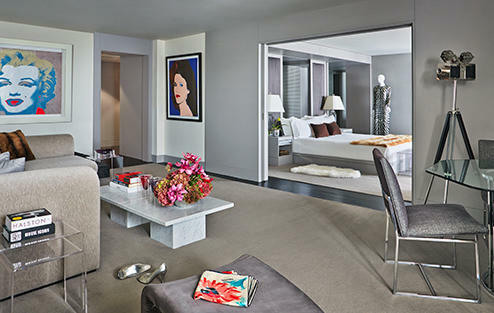 The bedroom features mirrored walls accented with silvery finishes, ideal for getting ready for a night on the town.